For five years, Alicia O. built a life beneath the rumble of traffic on the Francis Scott Key Bridge, unseen by the window shoppers strolling along M Street in Georgetown. The Puerto Rico native pitched a tent by the river alongside a cluster of other homeless people whom she would come to regard as a sort of family. They bathed in the river, took turns safeguarding their camp and visited a nearby church to fill their bellies with canned food. Alicia died with her family at her bedside, not under a bridge in Georgetown. Still, she was often cold and sick, coughing up blood, struggling with alcoholism, respiratory infections and then-undiagnosed schizophrenia. The doctors at Georgetown University Hospital’s emergency room knew the 55-year-old well – both for her friendly disposition and her numerous visits. 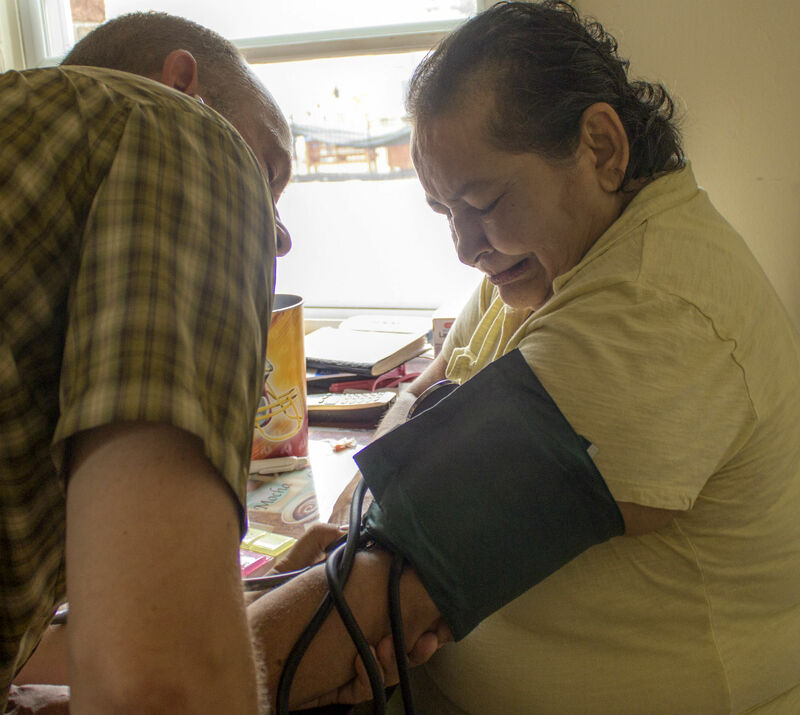 Two years ago, a local affiliate of Pathways to Housing stepped in and helped her get a one-bedroom apartment, along with regular medical care and other services. The New York City-based nonprofit uses a model called Housing First that works to get a roof over people’s heads while social workers and others identify the underlying causes of their homelessness, often mental illness and substance abuse. Alicia’s changed circumstances had been a point of pride before she died August 19 after suffering what doctors say was a pulmonary embolism and cardiac arrest. During her last hours, Alan Pickett, her nurse through Pathways, said she was still in good spirits and able to see her three children, whom he called when she was admitted to the hospital. Pickett said the years Alicia spent on the streets took a toll, with each visit to the emergency room having the effect of a “marathon on her body.” While a more stable life wasn’t a cure-all for her, she attained “a level of dignity – Alicia died with her family at her bedside, not under a bridge in Georgetown,” he said. Proponents of the Housing First approach, which has been replicated in 40 cities nationwide, say that investing in high risk patients like Alicia can also save taxpayers millions. Funded by government grants and charitable donations, the programs can curb the high health care costs that the more than 630,000 homeless people in the U.S. incur through repeat ER visits, hospital stays and preventable, recurring illnesses. Without health care and shelter, a homeless person in the U.S. is twice as likely to land in the ER as someone with a stable living situation, and to stay there longer, according to a study by the Denver Health Medical Center. Using the Housing First model developed by New York University psychiatrist Sam Tsemberis, which combines housing with wraparound services like health care, those numbers dropped significantly. A 2009 Journal of the American Medical Association study of a Seattle-based Housing First program determined that the average monthly health and criminal justice costs of a homeless person dropped from $4,066 to $1,492 after six months of housing. Similar results were documented in San Francisco and Philadelphia. The programs also reduced ER visits by 58 percent, according to a national study by the Corporation For Supportive Housing. “Good services and health care is cost effective and humane – there is no doubt about it,” said Steven Baron, director of the district’s Department of Mental Health. He said the agency has access to about 800 housing vouchers specifically for those with mental illness. To be effective, the housing has to go hand-in-hand with a health care program, which helps tenants stay in their homes, he said. Baron said the power of programs like Pathways lies in their team approach, which brings together nurses, psychiatrists, counselors and other specialists to identify and treat the severely mentally ill, who make up at least 25 percent of the homeless population. Alicia, who became homeless after struggling with alcoholism and schizophrenia, said she was approached by Pathways outreach workers when they came by her spot under the bridge to introduce themselves and distribute food. As she built trust with a woman from one of the teams, she learned about possibly finding a home. Within a year, Alicia had left her spot under the bridge for an apartment in southwest D.C., which she furnished with the help of her family. There was no easy fix for her chronic respiratory infections, for which she often used an oxygen tank, or the extra weight she carried on her petite frame. Even so, a more stable life helped her plan and keep doctors’ visits, stay on her medications and live a healthier lifestyle. The process was slow — securing housing with a voucher can take months or years, said Sandra Flores, an outreach worker employed by Pathways and the Golden Triangle Business Improvement District. There was little talk of housing when Flores and her team member, Emily Horen, walked through their assigned portion of downtown D.C. Some people were already on the waiting list for a voucher, others were wary after a bad experience at a shelter or housing project. Instead, the team focused on immediate needs – medicine for a rash, an appointment for a valid ID. Douglas Reed, a nurse practitioner who works at the NoMa-based clinic jointly run by Pathways and Unity Health Care, said meeting the needs of the homeless requires understanding their lives. Someone living on the street might have trouble taking their prescriptions on time, storing insulin without a refrigerator or making it to doctors’ appointments. “You have to be creative,” he said. Reed tries to tailor his treatment by putting ice packs in their backpack to keep medicine cold, or changing a dosage to make up for the inconsistency. He has also pushed reluctant specialists like oncologists to treat patients covered by a government health plan that might pay the doctor less. With some help, he said, patients who would otherwise land in the emergency room get a treatment plan, with a primary care doctor or nurse playing quarterback. Shortly before she died, Alicia told the story of her journey from the streets to stability. She spoke with more nostalgia than bitterness – focusing on the friendships she made, and the hope she might find a job. At her home – adorned with a painting of the Virgin of Guadalupe and pictures of her grandchildren – she said there was no reason to look back. Frequent ER visits had become a thing of the past, even though she spent much of her week shuttling between doctors’ appointments. On long car rides and in waiting rooms, she and Pickett talked about what to do about glitches with her rent payments or what might be making her anxious. Pickett came to know Alicia’s affinity for making friends in every situation, including “big, street-y dudes” in her neighborhood. He knew her live-in boyfriend Ramon, and that she had received flowers on Mother’s Day despite a sometimes tense relationship with her children. “Alicia is a total trooper,” Pickett said during a visit this summer as he checked the prescriptions on her kitchen table. With his help and her boyfriend’s, she had made changes that seemed impossible when she lived in a tent. She hadn’t had a drink for at least a year, and had cut back to two cigarettes a day. When Pathways started a walking club, she joined with enthusiasm, and attended the center’s Zumba class on occasion, toting her oxygen tank. “I was in the dump and they took me out of the dump,” she said. Pickett said that after living for so many years separated from society, Alicia had returned to being a vibrant part of a community.